Janine's paranoia spirals further when Michael lies about his whereabouts - will she be able to bury her all-consuming doubts? Kat attempts to end her affair once and for all. Michael suggests to Janine they start afresh. Janine restrains herself from opening a letter marked ‘urgent and private’. After discovering Michael’s lying about his whereabouts, Janine interrogates Billy who admits Michael was talking flirtatiously to a woman on the phone and mentioned George Street. Forgetting Scarlett, Janine heads straight there; Michael’s nowhere to be seen but Kat’s emerging from her lover’s flat. Later, Billy finds Janine in tears. However, by the time Michael returns home, Janine’s immaculately dressed and cooking his favourite dinner. Whilst Michael’s changing, Janine calls Billy and tells him not to worry, she can look after herself. The Vic re-opens bed bug free. After ignoring texts from her lover, Kat retrieves a negligee from the George Street flat. Jean finds Kat’s flat key in the food waste. Kat gets a text ‘I get the message. Maybe in another life’. Kat heads to R&R with Kim and dances provocatively in full view of the three Branning brothers. Later, she lets herself into the flat and calls her lover ‘I’m waiting’. Alice’s angry with Derek for driving Anthony away, all he knows is intimidation and stealing. Trying to prove her wrong, Derek gives away then pays for all the fruit and veg on Ian’s stall then takes him to the pub. 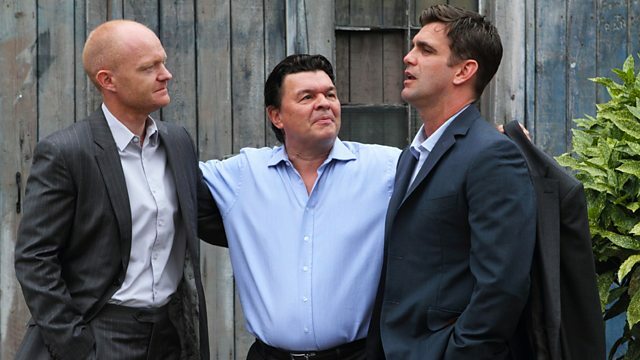 However, Derek’s friendly façade soon cracks when Ian criticises Joey. Exasperated, Alice and tells a surprised Fat Boy she’ll see him at R&R. Derek persuades his brothers they should all go to the club. There, Alice’s disgusted when Derek tells Fat Boy to keep his hands to himself. Jay’s depressed; Lola insists he’s got her and Lexi. Jay has to hide when a Social Worker unexpectedly visits Lola. Lola’s amused; Billy lectures Jay and, agreeing with him, Jay tells Lola to stay away, he’s bad news.